September 23, 2012 - Samsung Electronics America, Inc. and Intelligent Decisions (ID), Inc., announced that the Samsung Series 7 Slate has been awarded the network slate tablet category contract under the U.S. Air Force (USAF) Client Computing and Servers blanket purchase agreement (BPA). ID and Samsung are partnering to deliver the Samsung Series 7 Slate, which is the first device selected under the new network tablet category, available for deployment at USAF bases worldwide. 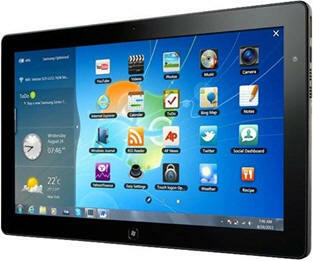 The USAF has added the Samsung Series 7 Slate to the BPA effective immediately. The Samsung Series 7 Slate provides the USAF standard desktop configuration implementation of Windows 7 Professional and supports all the same programs as a full-size PC, in a slim, light tablet form-factor. At just a half-inch thick and featuring a responsive 11.6-inch touch screen, the Series 7 Slate allows for convenient use on the move but can also be docked or connected to an optional Bluetooth keyboard so no PC functionality is sacrificed. The Samsung Slate is delivered with a Trusted Computing Group certified, Trusted Platform Module 1.2 chip. With no rewriting or retraining necessary for IT departments, this tablet solution has established a reputation for conquering security, acquisitions and functionality hurdles. With a powerful Intel Core i5 processor and 4GB1 of DDR3 system memory, the Series 7 Slate meets the Air Force’s Gold Master standards for computing performance. The Samsung Series 7 Slate is fully compliant with the Trade Agreements Act (TAA), a requirement for government agencies and educational institutions purchasing products with government funds. For agencies such as the Air Force with strict security requirements, the basic input/output system (BIOS) of the Series 7 Slate is NIST SP800-147-compliant and fully supports secure BIOS integrity measurement mechanisms.